"Reunion - Part 2 of 2"
Equus is beating Karate Kid and Una in battle while Supergirl lies under a train car, bleeding and dreaming of her days with the Legion, which she now remembers. She wakes up and rises from the ground and tosses the train car into orbit. She lays a beatdown on Equus, and Karate Kid and Una inform us that Kara has all the power in the world and doesn't know how to use it, in case you weren't paying attention for the past three years. Kara gets some goop on her face from Equus's chest (?) and Karate Kid CHOPS EQUUS' ARM OFF WITH HIS BARE HAND. Supergirl uses freeze breath to subdue Equus and Mr. Orr (sigh) shows up to take him away. Supergirl thanks Una and Karate Kid for reminding her of her days with the Legion, which she believes she forgot about due to a post-hypnotic suggestion from Brainy. She leaves, and Una and Karate Kid have no idea what she was talking about. Kara goes to see the Kents, and Superman shows up to have a talk with her. She's defensive and angry and says she's doing the best she can and can get by on her own, and Superman says he knows that, much to her shock. He then says she could benefit from being around people with similar problems and says she should join the Titans, who have come to the Kent farm with him. Story - 3: I feel bad giving this book another 3, I really do, because it's still head and shoulders better than pretty much anything Kelly did on the book. And yet, so much of this book doesn't work that it leaves me rather confused. The entire first page is wasted on reactions from the cops, which serve no purpose and could have easily served as at least ONE page where Kal and Kara finally talked things out. This book gives us about ten seconds of that near the end, but that's just not enough for all the problems Kara's had. Sadly, fellow Super fans, I don't think we're ever going to get that talk. It'll remain a bone of contention for years to come and a telling sign of how badly this book was mishandled. But I digress. Equus is apparently the new Doomsday, who learns and adapts and can't be defeated the same way twice. Is that really necessary? It just seems like they're arbitrarily trying to build him up as harder to defeat, but does anyone even care? It's Equus! Ring me when he and Orr kill each other in a head-on collision and then I'll actually be interested. The post-hypnotic suggestion thing is a lame cop-out deus ex machina. There could have been some hints that Brainy was going to do that to her or something over in Legion and then it would have worked, but there haven't been any at all. It felt like, "Well, we need to explain this and we didn't plan it out and have no idea what to do" and so they just went with the first thing they thought of. It's lazy. But the issue at hand may just be poor timing, as Kara hasn't left the Legion book yet and so some hints that Brainy is going to use hypnosis on her may yet be coming... which is another major problem with this issue. And she appeared as a team member in Teen Titans #50 last month! That's ridiculous and I personally find it a bit appalling that an editorial gaffe like that would be made, and I shudder to think it may have been planned that way. Why add to the confusion? Why not make sure the events happen in the correct order? It's baffling. So you can see why I feel bad giving the writing on this book a 3 when a lot of the problems with the writing were due to outside sources not the fault of the writer (the Countdown tie-in, the very poor timing). But one thing I have to fault the writer for is all of the Teen Titans showing up on the Kent farm to recruit Kara... and being led there by Superman! So all of the Titans now know Superman is Clark Kent? I would have expected Robin might know, and Wonder Girl. But Kid Devil? Miss Martian? Ravager? Art - 5: Okay, so Kara emerges from under the train bleeding (why would she bleed after getting hit by a train? ), and then the blood miraculously disappears as soon as she's out from under the train... this makes no sense. Because the art is just that good. 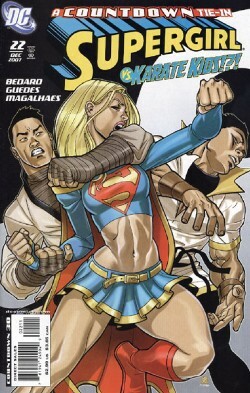 Cover Art - 2: Kara fighting two Karate Kids! And she doesn't actually fight either of them, not even metaphorically. Sensationalism on covers to sell comics, you say? I mean, it's not like this cover reduced Kara's skirt back to a glorified (and dangerously low) belt again, even though it's no longer depicted as such on the interior, right? Guys, seriously now, listen to me. You want more female readers on this book, right? A noble and worthy endeavor. So you get a new writer to take the book in a new direction. But then you make him do Countdown tie-ins that are senseless and rather ruin the book as a stand alone for two months. You want more female readers on this book, right? A noble and worthy endeavor! So you get a new artist to draw Kara more realistically. But then you give the covers to someone who does more of the same old Churchill-style artwork and makes Kara look like a streetwalker in primary colors. Get your act together, folks! Kara deserves better.